Marcel Hirscher admitted it felt surreal to become the most successful Austrian World Cup racer of all-time after clinching victory in the slalom in Saalbach-Hinterglemm. The 29-year-old bounced back from his giant slalom disappointment the day before, in which he finished in sixth after three mistakes on his second run, to reign supreme in the slalom. He claimed his 63rd World Cup career victory in a combined time of 1:54.98 seconds, which meant he overtook compatriot Annemarie Moser-Proell, who had 62 wins. And the seven-time overall champion, a two-time Olympic gold medallist, was over the moon with the achievement after registering his fourth straight slalom triumph. “It sounds amazing, but it’s quite surreal right now,” he said. “There will be a time when I can really enjoy this, but for the moment it is amazing to have another victory. “It was one of the hardest slalom races I’ve ever skied in, it was really hard, but it’s amazing to be in first position. I made the right choices as I made big mistakes yesterday. Hirscher held on to a big first-run lead to finish 0.38 seconds ahead of Loic Meillard of Switzerland, who jumped up from 12th to edge Norway’s Henrik Kristoffersen into third. 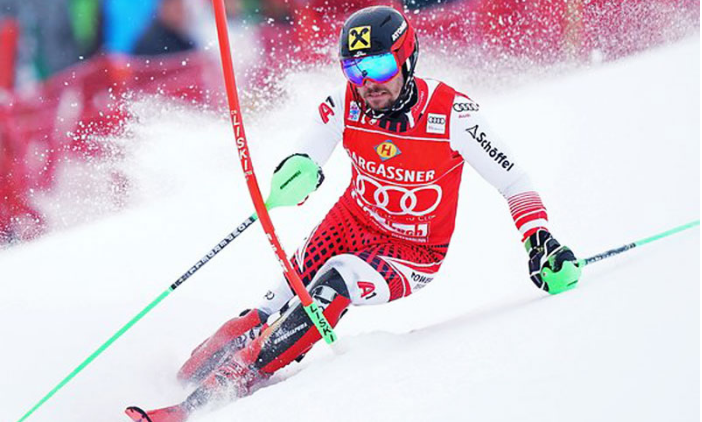 It was a perfect response from Hirscher after his run of 18 consecutive podium finishes in the giant slalom came to an end and means he tops the overall standings with 620 points. Kristoffersen sits in second overall after coming third in a combined time of 1:55.45 seconds, 0.47 seconds behind Hirscher, while Meillard is up to fifth after posting 1:55.36 seconds. Only Sweden’s Ingemar Stenmark (86) and American Lindsey Vonn (82) have more World Cup race wins to their name than Hirscher, who has won nine of the last ten World Cup slaloms.